Did you know that sloths sleep 20 hours a day? We didn’t either but Best of Orlando recently met up with SeaWorld Orlando Animal Ambassador Corey to learn more about this slow moving creature. 1. Sloths love flowers. 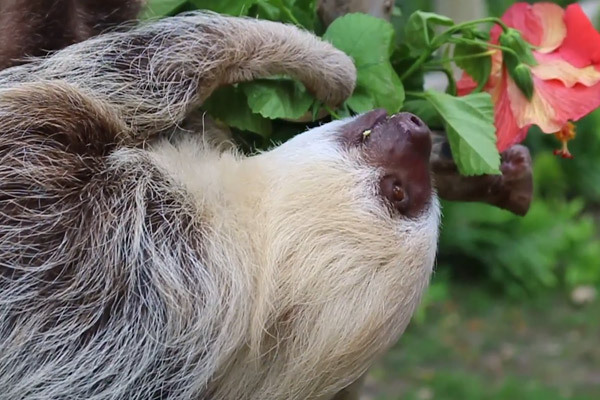 – Sloths diet consists of fruits and vegetables but Mila’s favorite food is the hibiscus flower. This is typically her dessert at the end of the day. 2. Sloths have long nails for hanging. – Sloths have long nails, which look more like claws, to help them hang onto trees. They love to hang upside down and when they do their nails wrap easily around the trees. 3. Sloths do not have any front teeth. – Sloths have sharp teeth on the side with molars behind. However, they do not have any front teeth! 4. Sloths use their teeth and nails for protection. – Those nails and teeth come in quite handy against predators. Because they are the slowest animal in the world and cannot easily escape a predator, they use their sharp teeth and nails to fight. Trees and the forest are also important to sloths because it helps give them protection. The animals grow algae on their hair, which turns them a shade of green, helping to protect them even more. 5. Protect sloths, protect rainforests. – Sloths thrive in the rainforest so if we want to help protect them we need to make sure we are not wiping out the rainforest. Ways to do this include buying sustainable produce and shade-grown coffee. A ticket to SeaWorld can also help protect sloths. SeaWorld donates $1 million a year to conservation efforts around the world, including the organization that rescued Mila. A portion of admission sales are used to help support these animals in the wild.